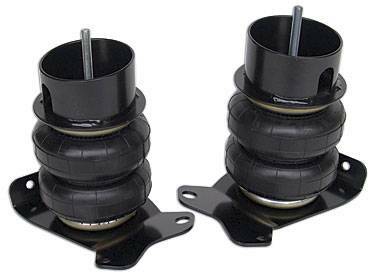 CoolRide front air spring/bracket kit for 79-93 Mustang. For use w/ stock lower arms. Includes air springs, brackets, & hardware. This is where "Air Ride Technology" begins and is still a valuable solution for many applications. The CoolRide® system replaces the traditional coil-spring and shock with an air spring and shock as separate units. CoolRide systems are engineered to perform and come with all hardware and brackets. The CoolRide® system will raise and lower the vehicle, improving the handling and offering a terrific ride. May not work with aftermarket K Member.